Carbon Monoxide alarms (CO alarms) are designed for residential use and available in mains and battery power options to keep you and your family safe. 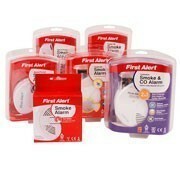 Smoke alarms in your home or business premises offer you the most precious gift of all in an emergency situation; time. The early detection and warning provided by smoke alarms gives you and your family or staff time to evacuate, before hidden smoke or flames would normally be smelt or heard by you. A smoke alarm can reduce fatalities in a fire by a massive 90%, and doubles your chances of survival; if it is working, of course. A smoke alarm with a dead battery is as useful as a bicycle to a fish. Far worse, in fact, as it lulls you into a false sense of security. So, always test your alarms regularly, replace their batteries, and if in doubt as to whether one is working correctly, replace with a new smoke alarm rather than take the risk. Smoke consists of burnt particles of the combusted material. Many modern materials contain harmful chemicals and smoke is a common killer. It will move vertically and horizontally through air. Smoke flow can trap air in corners and crevices so keep smoke alarms well away from edges of ceilings or roof pitches. Stop the air moving and stop the smoke spreading so use combined fire and smoke seals with the brushes. Our range of Kidde, Firex, First Alert and Dicon smoke alarms and smoke detectors feature a test button to test functionality and a distinctive audio 'chirp' sound indicating when the battery is low. So, you will always know when to replace your battery. Smoke alarms are remarkably sophisticated pieces of fire safety equipment, yet they are discreet and exceptionally good value for money. For just a few pounds, you can protect your home and premises with ease and Fire Protection Online offer a range of smoke alarms to suit all situations. If you are unsure of what smoke detector and alarm to install, just email us for advice. The positioning of your smoke alarms is important, as some units are not suitable for use near bathrooms or kitchens. If in doubt, email us for advice. For commercial and business premises, it pays to have a professional fire consultant look at smoke detectors in the context of your fire prevention and safety risk assessment, or ask your local Fire Officer for advice..
Our low cost, high performance battery smoke detectors are ideal for a hallway, landing or small office, and feature that important low battery alert signal, and a test button. To help guide you to safety, our escape light model features an automatic light too. 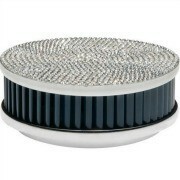 Best of all, these slim smoke detection units can attach to the ceiling with two small screws or even sticky pads, if the thought of using a screwdriver worries you! And with our 10-year sealed smoke alarms, you don't even need to change a battery. Basically, you install this beauty and forget it, as an alarm will sound when the unit reaches the end of its 10-year life. The unit still features a hush button and a test button, so you can be sure it is working properly during its incredible 10 years of service and protection. Our range of Firex 230v mains smoke alarms come with 9v battery backup and can be connected for a comprehensive system to protect your premises. The range includes optical smoke alarms, long life smoke alarms, heat alarm, and a remote test and hush switch. Thanks to the increased reliability of wireless technology, the Kidde Slick wireless range of smoke alarms allow remote testing, auto reset and 'hushing'. Originally developed for social and private housing projects, and designed to be fitted quickly and easily, all Kidde Slick alarms interact with other Kidde Firex alarms. Carbon monoxide, or CO gas, is produced by faulty gas appliances, and is extremely dangerous. Our bodies regulate our breathing not by the amount of oxygen in our blood supply, but by the levels of CO2. When CO2 levels rise, we breathe in. However, carbon monoxide does not have the same effect. This colourless, odourless, tasteless gas reduces the amount of oxygen your blood can carry. Overexposure to carbon monoxide in concentration of over 100ppm results in carbon monoxide poisoning, which can prove fatal. A mild dose due to exposure to concentrations under 100ppm results in headaches , dizziness, tiredness, nausea and being sick, symptoms which can be mistaken for flu. So, to prevent CO in your home environment, make sure that all gas appliances in your home are regularly serviced, especially gas boilers and heaters, as all servicing involves CO testing. Also ensure that all flues and chimneys are kept well swept, as open fires can produce CO if a flue or chimney is blocked. 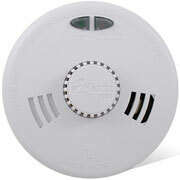 Then, to keep safe, install carbon monoxide detectors in your home, usually one per floor/storey. Carbon monoxide detectors, unlike humans, can detect very small concentrations of the gas in your home, and make sure you know about them as soon as possible! Our carbon monoxide detectors are ideal for the home or office environment, and come with batteries, a long, long warranty and that all-important low battery chirp warning. Every home with gas appliances or fires should have at least one detector - buy yours now from Fire Protection Online and don't forget the smoke alarms.